The ETSF workshop series provides a forum for excited states and spectroscopy in condensed-matter physics, chemistry, nanoscience, materials science, and molecular physics attracting theoreticians, code developers, and experimentalists alike. 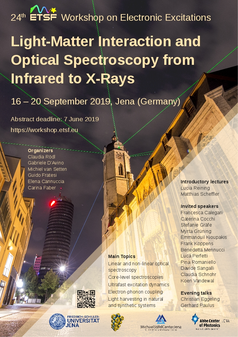 Light-matter interaction will be at core of the 2019 edition of the ETSF workshop. Cutting-edge spectroscopy experiments allow to probe electrons, plasmons, excitons, and phonons across different energy and time scales with unprecedented accuracy. A deep physical understanding of the underlying quantum many-body effects is of paramount importance to analyze experimental observations and render theoretical simulations predictive. The workshop aims at discussing the most recent advances in the theoretical description of the interaction between light and matter focusing on first-principles methods. This broad subject will be covered in its diverse declinations, from core-level spectroscopy to collective low-energy excitations, discussing also matter under extreme conditions, and systems driven out of equilibrium by strong laser pulses. Exchange between theorists and experimentalists is fostered to open new horizons towards the next generation of novel spectroscopy techniques. The workshop will also face the challenges posed by the formidable complexity of heterogeneous and nano-structured systems such as those of interest for light harvesting and energy generation, prompting to bridge the gap between experimental and in silico spectroscopy.